At Sunday's "72-ounce Challenge" in Texas, a 124-pound mother of four destroyed the competition. 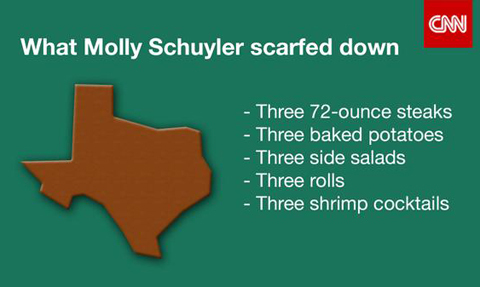 At a steak-eating contest held this weekend in Amarillo, Texas, Molly Schuyler wolfed down three 72-ounce steaks (plus a ton of sides) in 20 minutes, setting a record in the process. That’s more than 13 pounds of steak—a fact made even more impressive when you know Schuyler weighs 124 pounds. Let us do the math for you: she ate approximately one-tenth of her total bodyweight. CNN reports, “The Nebraska native, 35, is a professional on the competitive-eating circuit and once gobbled 363 chicken wings in 30 minutes.” Still, it’s damn impressive that she beat out football players and professional wrestlers, who were also competing in Sunday’s contest. Schuyler won $5,000 for her steak-gorging efforts. Her victorious win will be submitted to Guinness World Records. In response to finishing three enormous steaks and setting a world record, Schuyler said, “I get free steak, so I don’t really lose.” Now that’s a winning attitude.